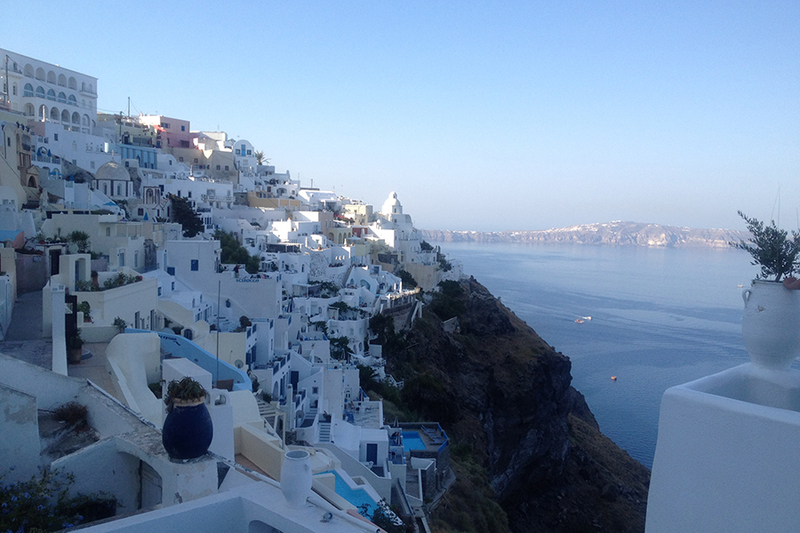 A summer in Europe isn’t complete without a visit to the Greek Islands! 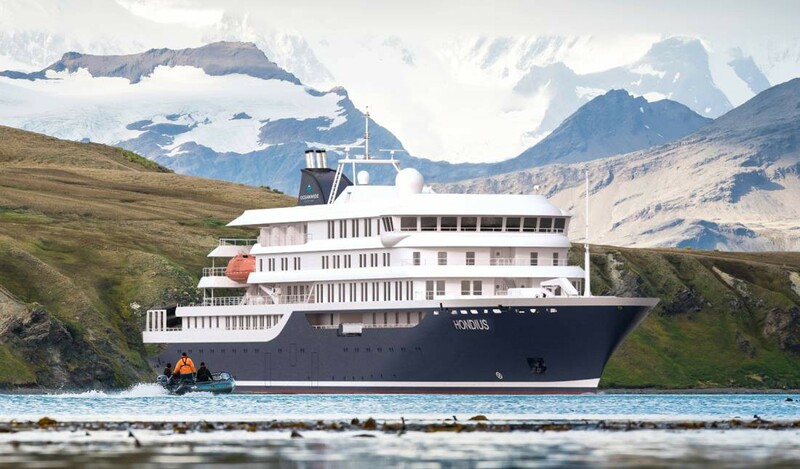 Yes, June/July/August is a busy time to visit and the weather can be quite hot – but for the 20/30 somethings, it really is a great time to explore these incredible islands! If you’re looking to avoid the crowds, but still experience these beautiful islands September is also a great time to visit. Our team member Adriana has been to a number of these islands during the summer and has put together a quick guide to some of her favourite islands. 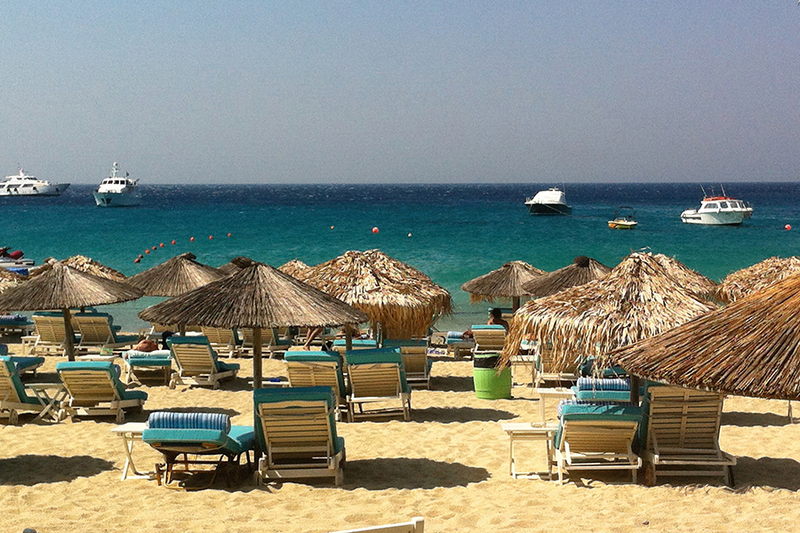 The obvious island to start with is Mykonos. I’ve been fortunate enough to visit Mykonos three times in July and each time I have loved it! Yes, it is known as a party island (and rightly so), but there is so much more to this beautiful island and you can visit even if you aren’t a party person and still have plenty to do. Relax on the beach sipping a (4 Euro) mojito, hire a quad and explore the island (be responsible, the streets are dangerous and busy so pay attention and wear a helmet! ), browse through the little boutique shops, get lost through the iconic paved alley streets and indulge in delicious Greek food (at a ridiculously cheap cost!) – dinner was quite often a Yiros and Mythos (local beer) for only 5 Euro! I’ve always stayed at Platis Gialos beach instead of staying in town, it means the beach is closer to your hotel during the day (which is where I spent most of my time) and access to the town centre is simple using their public buses that run between the town, beaches and out to where the main nightclubs are at Paradise Beach for around €1 to €2 . Just keep in mind these buses stop running around midnight so you will have to get a taxi after this time. It’s a popular honeymoon destination, and while there tends to be a lot more couples wandering the streets of Santorini, it is still a beautiful island to visit if you’re single or travelling with friends. I stayed in the main town of Fira, in a hotel that overlooks the caldera (it’s worth spending a little more on your hotel to have these breathtaking views as you open your room door every morning). Similar to Mykonos, there are lots of little streets to get lost down and explore, although I found the shops were a little more expensive and fancier here. Heading to Oia to watch a sunset is a must, it’s the only place in the world I’ve seen a crowd applaud mother nature for making the sun go down so beautifully! I also did a day trip relaxing on board a catamaran, admiring the island from a new perspective and visiting both the red and black beaches and swimming in the sulphur water (another experience I’d highly recommend). Again, the food in Santorini is delicious, although a little more expensive than most of the other Greek Islands. Ios is very much a party island – I don’t think I saw anyone over the age of 40 here. It’s a small island and at night the narrow alleyways come alive as bars open and young tourists fill the street. Most of the bars are barely big enough to fit 20 people, but there are places to sit in the streets and people fill up the alleys and hop from bar to bar partying the night away (and collecting free tshirts in return for having a shot). If you’re game there’s a larger bar in Mainsquare called Slammer Bar – they serve a special shot where you have to wear a helmet, take the shot and then a bartender hits you over the head with a mallet / skateboard or similar (another reason why you may wake up with a headache). Our days were spent lazing by the pool or on one of the many incredible beaches, but if you’re looking for a more active way to spend your days there are some hiking and trail options as well. Two – three nights is ample time to spend on this island. Far Out Village is a popular accommodation option for young travellers, here the party vibe continues all day long and it’s walking distance to Mylopotas Beach. Crete is the largest of the Greek islands and the most populated. The best way to get around in Crete is to hire a car, as this is the easiest and cheapest way to explore as much of the island as possible without relying on taxis. However, if driving isn’t for you, you’ll still be able to have a great time even without the car! I stayed in Heraklion, which is the capital of Crete, in a hotel close to the water and walking distance from the city. 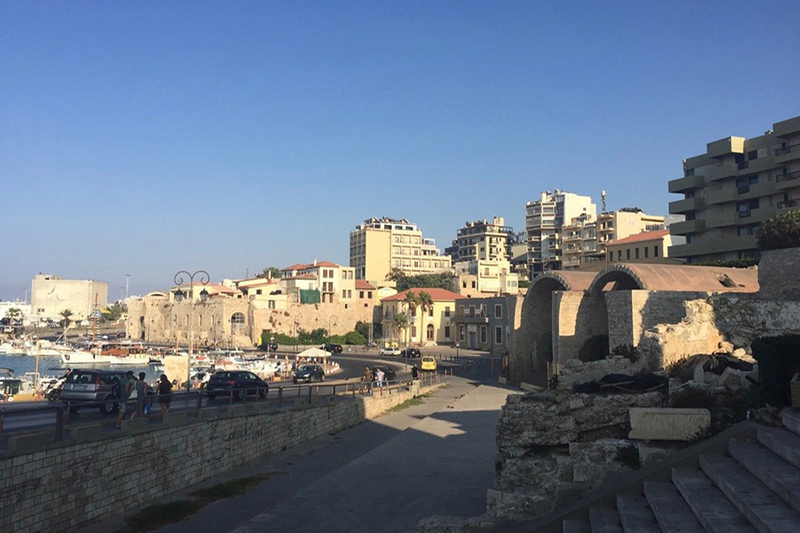 I only had a couple of days, so I decided not to venture too far out from Heraklion and instead just spend the time exploring this wonderful port city. I did the hop on hop off bus, always a great and cost-effective way to get your bearings in a new city and learn about the city at the same time. I ventured out by bus to explore one of the many beaches and wander through the local beachfront shops. For those who enjoy keeping active, Crete is great for hiking, water sports, scuba diving and off-road adventures and if you have access to a car, there are some spectacular beaches, including the famous Balos lagoon and Elafonissos which you’ll recognise from travel brochures. Crete has less of a small Greek Island feel compared to the other islands, with a more developed city, but it has a fascinating history and culture. Paros has all the charm of Mykonos, without all the crowds! 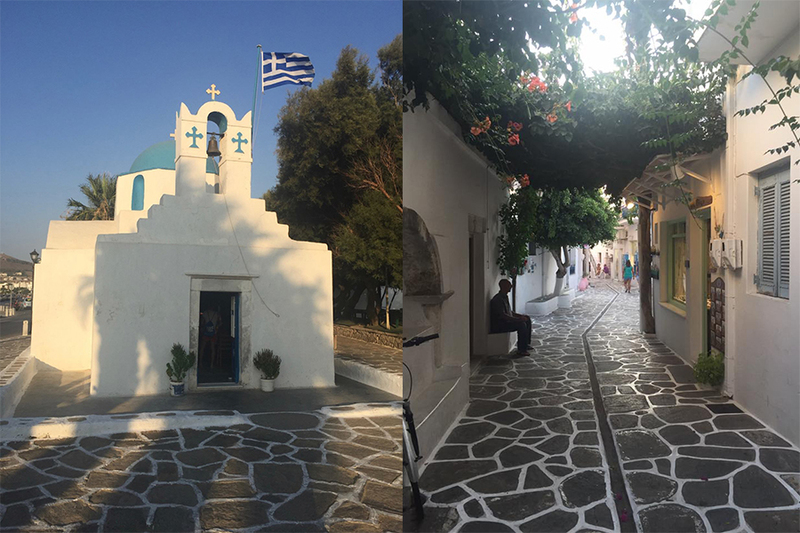 It’s exactly what you would expect from a Greek Island – whitewashed houses, paved alleyways and blue-domed churches. The food was fresh and delicious and best of all it was one of the cheapest of the islands for food, drink and activities. As you pull into Parikia, the main port of the island, you disembark (in a wave of organised chaos as you do on most Greek ferry rides) and you’re greeted by the busy waterfront filled with restaurants, cafes and travellers and locals enjoying the beachfront views. I chose to stay in Parikia, meaning I could walk to the beach, to explore the old Town and be close to a range of services. Walking through the maze of alleys in the old town took me back to Mykonos, however it was quieter and didn’t feel as touristy. I managed to find a small café with a tiny balcony (that I wasn’t sure was even safe to sit on) and look out over the Aegean Sea and take in the simplistic beauty of the island. As with the other islands, there are plenty of water activities and sightseeing to be done and there are plenty of other little towns and villages on the island. I took a water taxi one day that took me to Martselo Beach, a quieter part of the island, where I could relax on a secluded beach and soak in the European sun (with another mojito in hand of course). The Greek Islands are one of my favourite places to visit in Europe during the summer. The food is AMAZING, it’s cheap, the views and atmosphere are second to none and the people are lovely. I’ve always done them independently with friends, organising our accommodation and ferry tickets before we depart. However, if you prefer an organised tour there are plenty of options for island hopping in Greece. 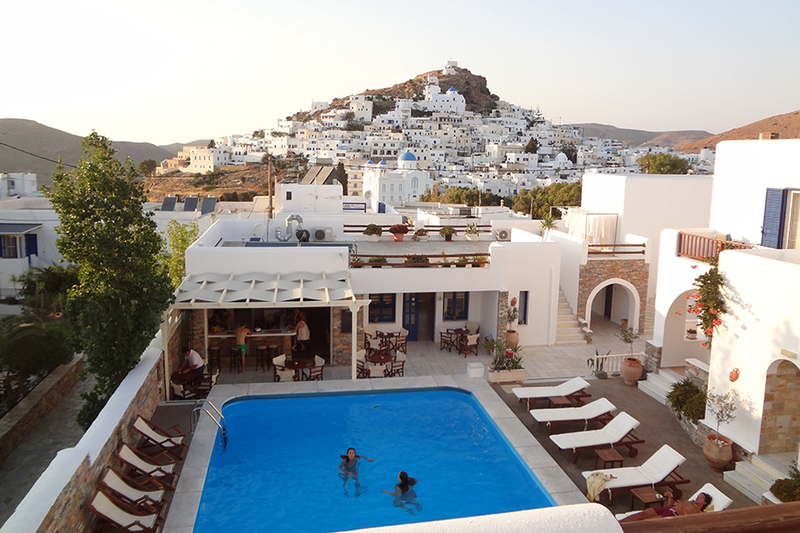 Contact our team of consultants today and start planning your summer in Greece now!